What are the minimum and recommended specs required to run Tabletopia? Why is my computer very slow running Tabletopia? If your computer is not powerful enough, some games with a lot of game components can run slower. Try changing the graphics quality. To change the graphics quality, go to the main menu of the game client in top left corner > Settings > required quality > OK.
You do not support my browser. What other options do I have? Tabletopia runs well on Internet Explorer and Safari. Chrome and Edge version were added recently but are still in Beta mode: games can take time loading for the first time. Also Tabletopia can be downloaded for Windows & Mac through the Steam platform for free. And later in 2017 a mobile app for iOS and Android tablets will be released. Is a Linux version planned? Tabletopia is based on the Unity Technologies platform, which does not officially support WebPlayer for Linux. However, during the porting of Tabletopia to Steam, we are aiming primarily for Windows and MacOS, and then Linux afterwards. I have a strict firewall. Which ports should I open for Tabletopia to work? How can I communicate with other players during the game? Are all Tabletopia games in English or there are also other languages? The interface is in English and German. We plan on making other languages available later. The languages of the games depend on the materials provided by the publishers. Many games are in English at the moment but later we plan on requesting graphic files for all languages the game was localized to. Also, a lot of games in our catalog are language independent. What is the current stage of Tabletopia? Tabletopia is in Early Access stage on web and is already released in Steam. A number of Tabletopia features are not yet enabled or integrated, such as the reputation system, player statistics, and many others. 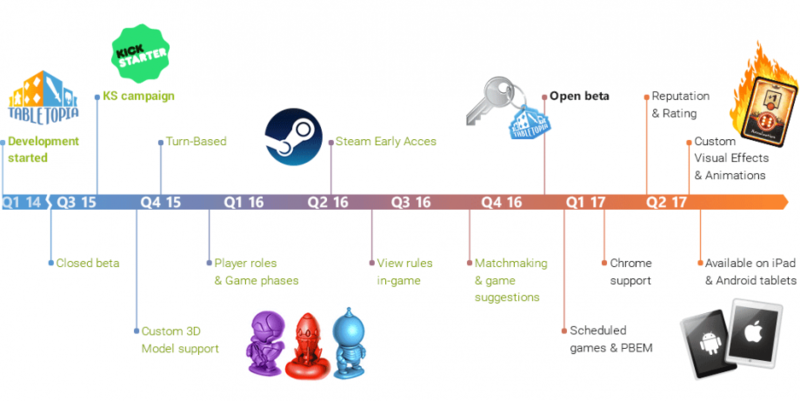 See our timeline for the estimated schedule of various features to be introduced. What can I do on Tabletopia now? You can play all games. We advise you to check the Player Guide which we have prepared. You can create your own game. Please check the Workshop section in our Help Center for more information. Please note that it is forbidden to upload / publish any content which you do not have the rights for or permission from the actual rights owner. You can test your game with a test group or find game testers within Tabletopia’s audience. For all questions regarding your profile, please see Managing Profile. How to sort the list of games? The default sorting for the list of games is done by Popularity in descending order, but you can change this to sorting by Name, Modified, or Recommended. You can also sort the games by type, age, number of players, playing time, or language. I am getting an error “You have reached a limit for opened game sessions”. What can I do? You have reached the limit of simultaneous open games for your plan (see more in Tabletopia Pledges and Plans). You need to remove one or more opened rooms to play other games or upgrade your plan. Can multiple players use a single device (similar to ‘pass & play’ on a tablet)? Yes! Almost any game in the catalog is available for Hotseat play, including those that have hidden information. Can a Tabletopia user invite people or can I only play with other Tabletopia users? You can play with your friends outside Tabletopia, they do not need to have a Tabletopia account to join your games. Send them the link to the room— they will play in browser for free. What is a Premium room? For all questions regarding game controls and actions with game objects, please see Interacting with Game Components. I have entered a game room, but I can not move anything. What should I do? As a spectator in a room, you can not interact with game objects. You need to take a seat (click one of the color ‘+’ at the upper part of the screen). I have entered a game room as Spectator, but all the seats are taken by offline players. What should I do? You may try to kick one of the offline players, if you see they are not playing. Just right-сlick one of the player avatars and choose ‘Kick’ in the menu. Please do not abuse this feature, only kick players when you are totally sure they are not going to continue the game. In future, this feature will be available only to the ‘Host’ of the game room. Why can I not put an object into the hand by dragging it to the bottom of the screen? Check if your hand is hidden or not (press H on your keyboard). Some game objects might be restricted by designer of the game so that they cannot be put into your hand. Also, in some games, the hand is disabled completely. Is it possible to Undo/Redo my action? There is currently no Undo/Redo functions in the Tabletopia game client. We are planning on adding them in future. How do I save the game progress? You do not need to save the game progress. It is automatically saved. You can leave the game room any time and continue playing at a later time. The game will carry on from where you left off. The game loading indicator freezes or does not load at all / the game freezes or crashes. What can I do? Make sure you have installed the Unity Web Player and the plugin is enabled in your browser (Safari, Internet Explorer). Version of the operating system (OS). Full version of your browser. In Windows, you can find your system specifications opening Control Panel → System or use programs like dxdiag or cpu-z. In Mac OS, you can find your system specifications by clicking the Apple logo in the upper left hand corner of the screen, and then selecting the “About this Mac” menu option. Run the game in browser and wait until the crash. Do not close browser tab with crashed game. 4. Copy the contents of the log file and send it to us (if the log is too big, you can use Pastebin or attach the log file to an email). Bug reports. To submit a bug, use the in-game “Send Feedback” feature. Your thoughts and suggestions. Send us an email on info@tabletopia.com, or post on our forum. Tell us what you think. What are the differences between Tabletopia and Tabletop Simulator? All games on Tabletopia are 100% legal and are received from game publishers. It is a platform for the whole board games market and gaming community. Tabletopia is more than just a virtual table: there are other parts to it, like player matching service, reputation and ratings, a workshop with many game objects, tools for publishers, social events, etc. Tabletopia is a cross-platform system: browser based, client based (Steam), iOS and Android coming soon. Usability and aesthetics are a subjective issue. If you are a TableTop Simulator user, you can try out our free demos, compare, and then decide for yourself which is better for you—we have had very positive feedback so far. Why don’t you sell each premium game separately? We do not sell each game separately because we believe that this approach would limit and narrow you experience with Tabletopia. We want you to have instant access to hundreds of board games, not just the ones you buy and download. We want you to be able to explore and discover new games every day, on a free of charge basis with premium plans being an option for those who want unlimited access to everything. Don’t cheat. Cheating is not good for anyone. Don’t kick other people from games without a good reason. Don’t curse or swear at the other players. Don’t harm anyone’s computer. Don’t distribute software viruses, or anything else (code, films, programs) designed to interfere with the proper function of any software, hardware, or equipment on the site. Don’t abuse the personal information of others. When you use Tabletopia — especially if you create a successful project — you may receive information about other users, including things like their names, email addresses, and postal addresses. Don’t use it for other purposes, and don’t abuse it. Don’t try to interfere with the proper workings of Tabletopia. Don’t bypass any measures we’ve put in place to secure Tabletopia. Don’t try to damage or get unauthorized access to any system, data, password, or other information, whether it belongs to Tabletopia or another party. Don’t reverse engineer any aspect of Tabletopia in an effort to access things like source code, underlying ideas, or algorithms.